On May 23rd, we arrived at the Tívoli Palacio de Seteais Hotel for a 2-day visit, after an UBER trip from Lisbon that took approximately 30 minutes. As we got into the car we felt as if we had gone back in time to the eighteenth century and felt as if the royalty themselves were waiting for us to arrive. The garden entrance is enormous, very well kept and flanked by many trees at the sides pointing the way to the main door. 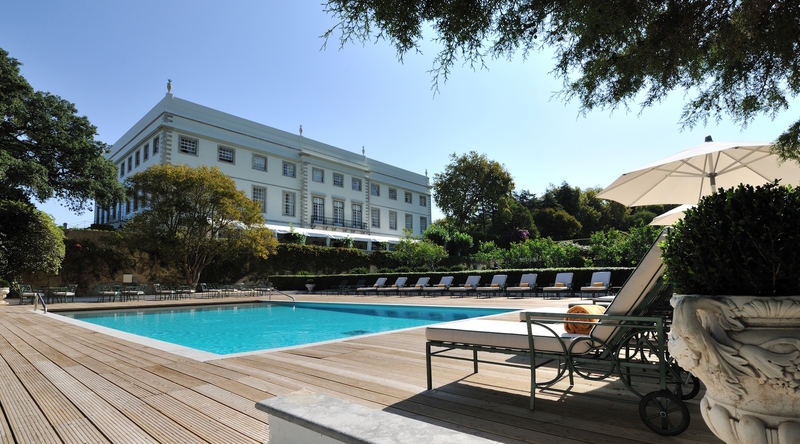 This hotel (formerly a residential home) was built in 1787 by the Dutch Consul Daniel Gildemeester on land given to him by the Marquis of Pombal. It’s built on the edge of a geographical elevation from which you can admire a large part of Sintra with impressive views. The palace was expanded in 1802 in a Neoclassical style with a U-shape, and the gardens were remodeled in pursuit of the Romantic trends. 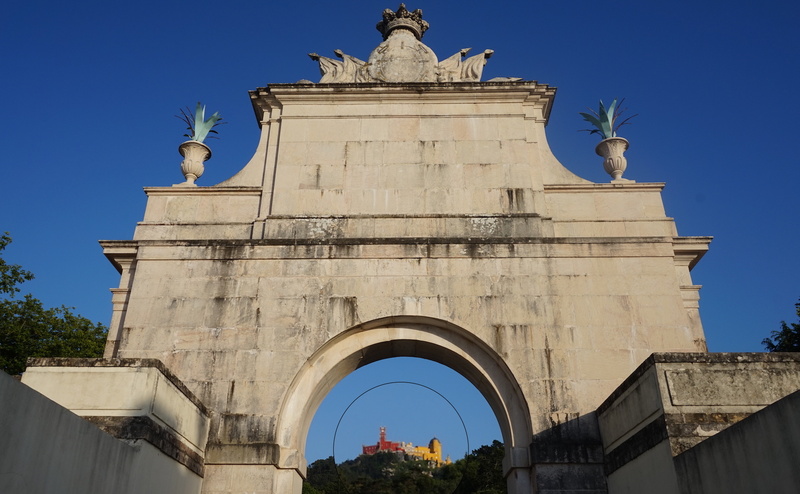 Later, the two wings of the palace were connected by a large Neoclassical arch in honor of Prince Regent John VI. 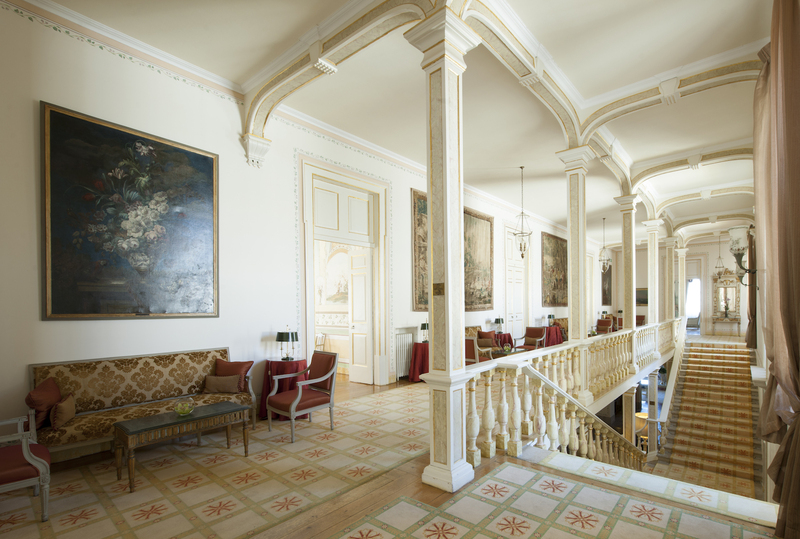 After changing hands several times, the Portuguese government bought the property and since 1954 it has become the best 5 Star hotel in Sintra for all tourists. Upon entering the hotel, we were taken to a very spacious and bright room with a majestic table, lamp and carpet. This was going to be the area where we would check-in. On the table were the famous Portuguese “quesadas”, lemonade and a damp washcloth. The hotel has only 30 rooms and we were assigned room number 8, from where we could see the hill with the Castelo dos Mouros (the view of the castle is amazing) and the Pena Palace. In the room there was water, wine and some local pastries as a welcome gift. The whole room was like being in a museum, as all of the furnishings were original from the era. We were almost afraid to touch anything. We showered and got ready quickly, then headed down to the lobby where our friend Joao from the Side-Car Tours was waiting for us. As we went downstairs, we admired the frescoes on the walls and the paintings from that time. Many of the rooms are decorated with frescos that are attributed to the French painter Jean Pillement. 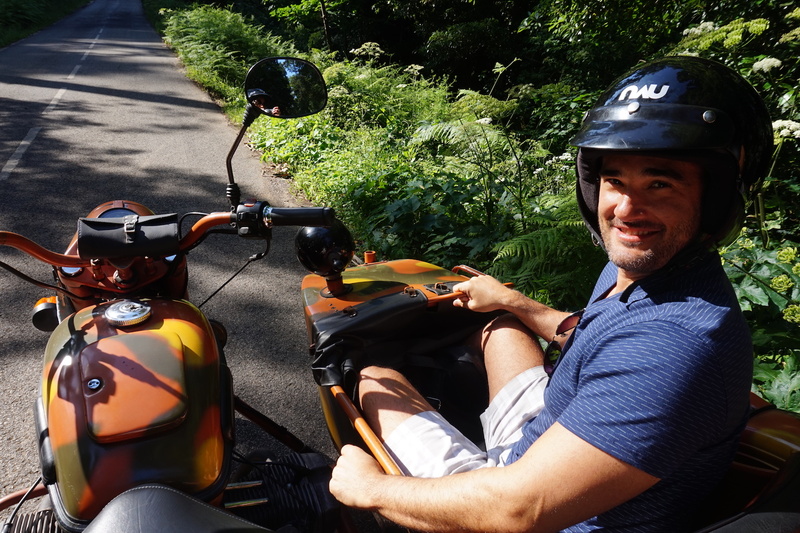 Afterwards, we went on our side-car tour with our friend Joao. We visited many different sites typically not seen on tours, and whose names we can no longer remember. It was magical. We visited Cape Roca (the western-most point in Europe) and were taken to an idyllic place called Molino Don Quixote, from where we could see some of the beaches that lead to Cascais and we ate something quickly. We got back to the hotel at 6:05 pm, that is, 5 minutes late for the tour prepared by the hotel for us at 6:00 pm. You should keep in mind that this hotel has a great history and it is really worth learning about the place where you are staying, and getting a tour. Mario was waiting for us, the hotel manager, with a guide who seemed very knowledgeable about its history, some other members of the hotel staff and, of course, a few more guests. The guide, who was very kind, started talking about carpets, the frescoes, tables, sculptures and even about the meaning of “Seteais”… which means “Seven Sighs” in Portuguese. As we walked, we encountered paintings, Flemish tapestries, mahogany antiques, large standing clocks. 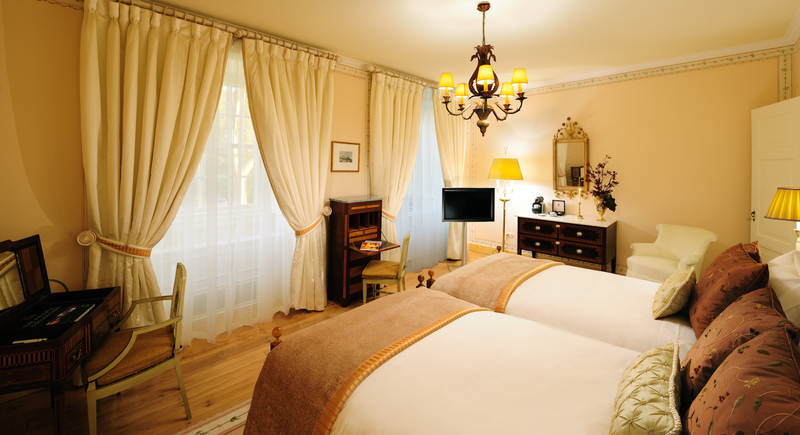 The rooms have very high ceilings (with floral murals and depictions of the era) and marble and wood floors. If we had to choose one thing, it would be the piano in one of the rooms. You have to see this piano… it is completely covered with paintings from the era and they say that only two like it exist in the world. They are working on restoring it, but the expert who supposedly has to do the job has a 3 year waiting list. Recent renovations have modernized the bathrooms in all rooms and they have put plasma TVs in each room. After the tour, we went to rest a bit as we were quite tired. After a while we decided to go down to dinner in the main dining room, but we made a small mistake… We weren’t dressed up enough! The dining room has a dress code so, so seeing how we were too tired to move, we decided to eat something quick in a restaurant just outside the hotel. 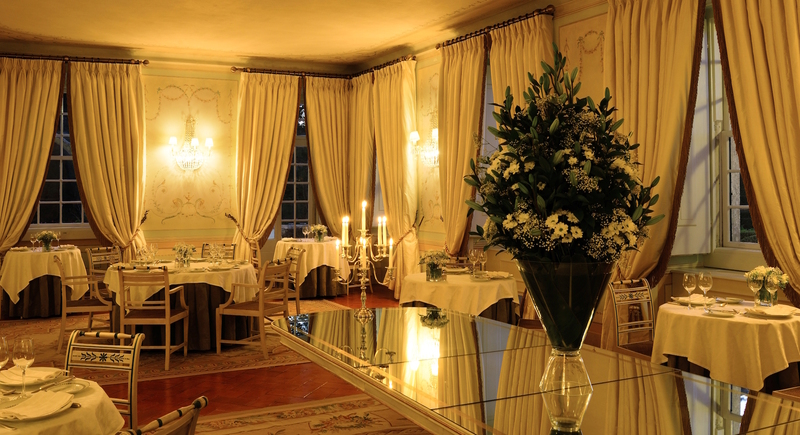 By the way, the hotel restaurant is considered to be one of the best in Portugal. After dinner, we went to sleep on our beds made for princes and princesses. 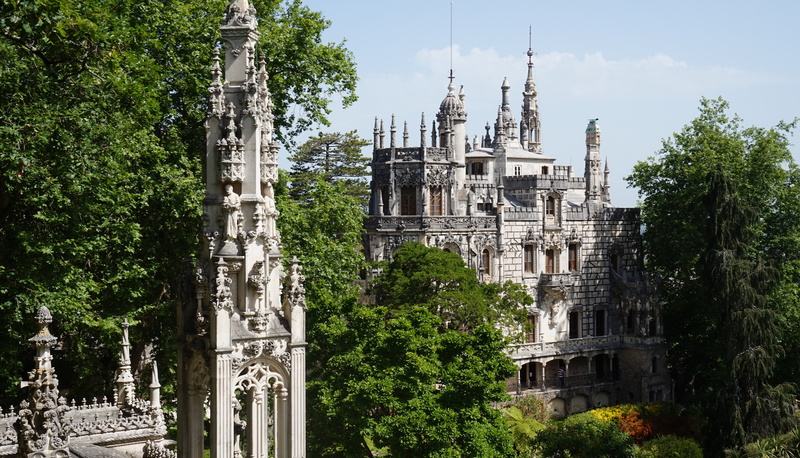 The next morning, we woke up ready to see La Quinta da Regaleira. We went down to the main dining room to have breakfast and our friend Jose was there waiting for us, always ready to make sure we had the best possible experience. The truth is that we hadn’t found such a kind, genuine and affectionate person in a long time. It made me want to hug him whenever I saw him. The breakfast was great, there was no buffet but they brought you the fruit and everything you wanted by just ordering it. Impeccable service and superb quality of food. We walked to La Quinta da Regaleira, as it only takes about 3 minutes to get there from the hotel. 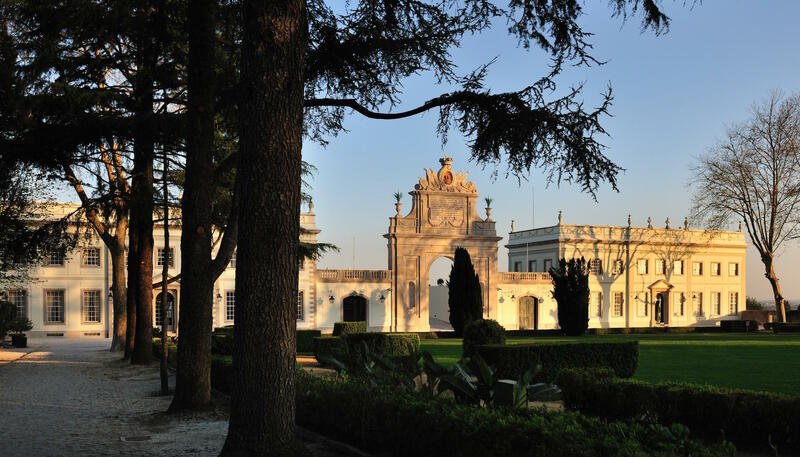 This palace-residence is worth seeing since it is an architectural gem from the era and demonstrates the knowledge and power that existed in Portugal at that time. We spent about 3 hours touring the grounds, seeing the gardens, the wells, the tunnels, waterfalls, and the inside of the palace. 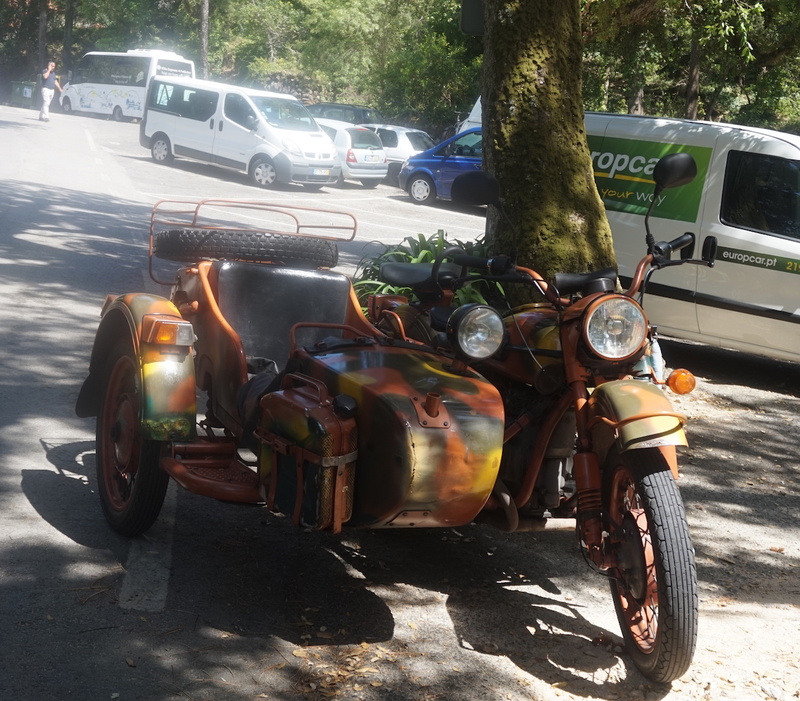 From there, we went to eat something in the town of Sintra and bought some of the famous Traveseiros de Piriquita. Afterwards, we took an UBER and went to Cascais. Cascais is wonderful, full of people, with terraces in the street, colorful and with the beach as its main attraction. After walking for a while, we went to dinner at Fortaleza de Guincho, a very famous restaurant facing the see. The experience was great as the sunsets are stunning, but I wouldn’t give it a 10/10 for the food. We then went back to the Tívoli Palacio de Seteais Hotel. On our last day in Sintra, we decided to go see the Castelo dos Mouros, especially the Pena Palace. Our day started out perfectly. Jose remembered everything we wanted and diligently brought it to us. 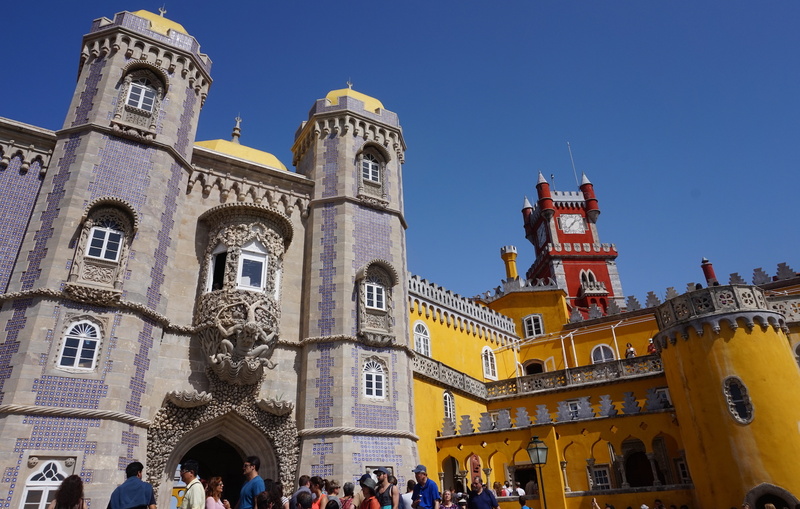 When we arrived at Pena Palace, we couldn’t believe it. How were they able to build such a wonder… and how could it be that I had never heard of this architectural and artistic gem? I don’t know… Castelo dos Mouros was interesting but too much walking for our fragile bodies and there’s really little to see apart from the views. We went back to the hotel to check out at 1:00 pm. 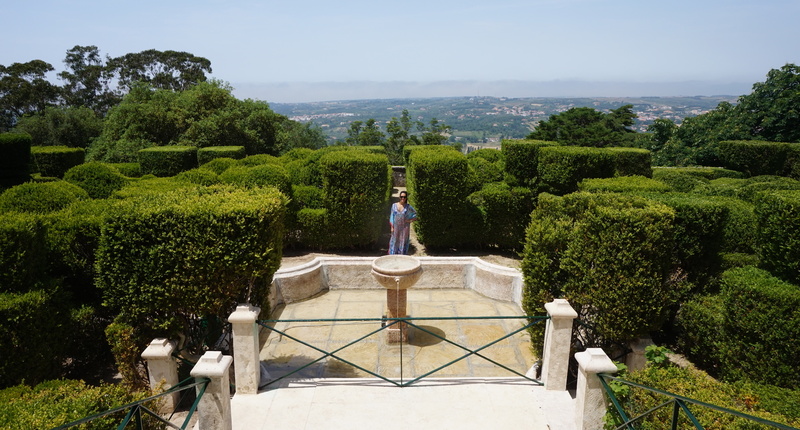 As we had 3 hours before heading to the Lisbon Airport, we decided to eat something fast, go down to the pool and walk through the labyrinthine gardens in the back. The pool is also worth seeing as it is surrounded by a wooden floor resembling what you find in 5 star Asian hotels. Afterwards, when talking to Mario (the manager), he explained to us that they will soon be putting in Balinese type beds to create a “zen” atmosphere in the pool area. They also have a yoga area under a huge tree, to absorb the positive energy it gives off. Mario also informed us that this year they were planning to build a Spa in one of the hotel’s wings. Knowing how things are done in this hotel, I have no doubt that it will be exceptional with an “Asian” touch. When we left, Mario came to say goodbye and gave us a small handmade tile that is typical of Portugal. What a nice touch! I don’t think we can say more about how amazing our experience at the Tívoli Palacio de Seteais Hotel was. It was simply a fairy tale. 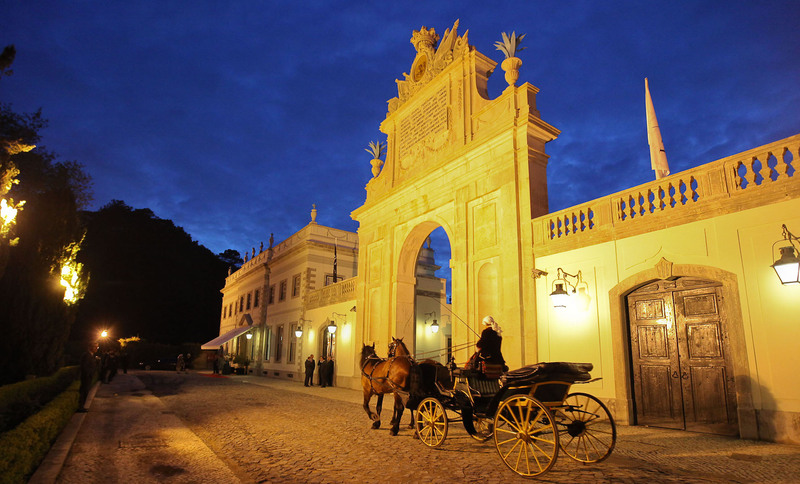 They treated us impeccably and we can wholeheartedly recommend it to anyone visiting Sintra because it is sure to make their experience unforgettable. We especially want to thank Mario, who treated us exquisitely. Always dressed impeccably, respectful, handsome and with a smile. It shows that he is a great professional and we are sure that the hotel will reach an even higher level than it already has… if that’s even possible.